Imagine being warm even on the coldest winter days ... from your feet on up! If toasty tootsies are the stuff that your January dreams are made of, you may be thinking longingly about underfloor heating for your home. Is radiant floor heat worth the high installation cost? Take a levelheaded look at its advantages and disadvantages so you can make an informed decision. Radiant Floor Heating, also known as “underfloor heating,” circulates heat through pipes or coils installed beneath the floor to deliver efficient, uniform warmth. With radiant floor heating, you will no longer have cold floors, and you will feel warmer in general since the system actually heats you and not just the room. Compare the advantages and disadvantages of radiant floor heating methods. Hydronic (“wet system”): Hydronic floors pump hot water through tiny underfloor pipes to warm the home. The most popular radiant floor type, they are costly to install but more cost-effective to run. Electric (“dry system”): Radiant floors warmed with electric coils are simpler in terms of installation, although they are more expensive to operate. Radiant: Radiant air floors, the least common, circulate hot air as the heating method. They can be used in conjunction with solar air systems. However, because air can’t hold a great deal of heat, they’re not commonly installed for residential purposes. High quality heating. Radiant floors give off a desirable, luxurious kind of heat -- quiet, even, and comfortable, with no noisy equipment or “cold spots” in the room. Energy efficiency. Radiant floor heat is more efficient than forced air because no energy is lost through the ductwork. Flexibility. You can choose to heat your whole home or an individual room, as you please. Popular energy-saving devices such as programmable thermostats are easy to integrate with the system. Low maintenance. The absence of moving parts means you won’t experience mechanical failure with radiant floor heating. As a result, it may be warrantied for as long as 30 years. Hypoallergenic heating. Because no air blows around your house from the heating system and ducts blowing, air quality improves as dust, pollen, and mold are reduced – good news for allergy and asthma sufferers. Reduced electricity consumption. This is especially true of hydronic radiant floors. Also, radiant heating is a more effective way to heat a person, so you’ll be able to lower the thermostat and still feel warmer. ASHRAE (American Society of Heating, Refrigerating and Air-Conditioning Engineers) reports that a home with a radiant floor heat system can have the thermostat set 6 to 8 degrees cooler than a typical convection- or forced-air-heated home without loss of comfort. Decreased need for humidifier. Because radiant heat does not change the air moisture content in the home (as forced air systems do), humidifiers are no longer necessary to maintain a comfortable living space. This means an additional savings in your electricity bill. Installation. 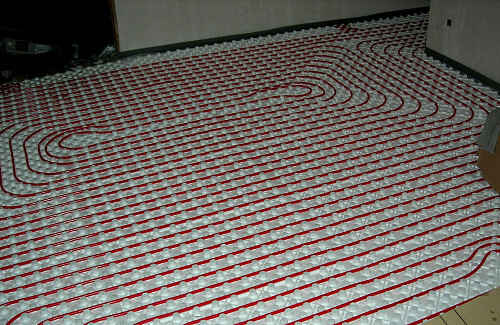 Radiant floor heating can be complicated and pricey to install, especially the hydronic type. Not a problem if you’re already planning an upgrade that includes flooring replacement or you’re about to build a new home. Otherwise, you may prefer electric floor heating, as some types can be located on top of existing floors. Another option is installing radiant wall panels. Flooring compatibility. Due to their thickness and the temperatures they can reach, radiant floor heating systems may not be compatible with some types of flooring materials. Natural stone, ceramic or porcelain tile, and concrete are fine, but consult the flooring manufacturer and your heating pro before using with hardwood, laminate, vinyl, linoleum, or carpet. Difficulty of access to repair. While radiant floors generally require fewer repairs than other heating systems, if something does go wrong, it is difficult to access components that are enclosed under the floor. Leakage or fire. There is a slight risk of leakage with hydronic underfloor heating or fire with electrical radiant floor systems. If you’re considering radiant floor heating installation, weigh the pros and cons and find a reliable HVAC contractor to help you make the right decision for your family.